This network video recorder is our most powerful 16 IP camera NVR as it features a Quad Core CPU. It can record all resolutions of network cameras, all the way up to these latest 4K security cameras which are 8MP and 12MP cameras. 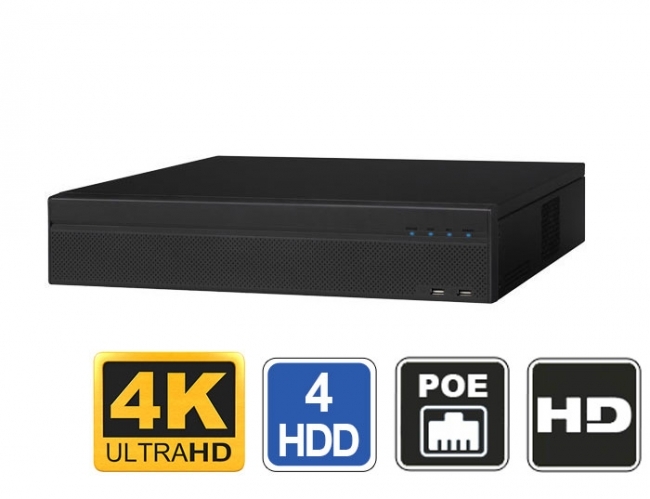 It utilizes the latest H.265 video encoding to encode video resolutions higher than 1080P, and is able to record up to 4K in realtime with the new 8MP 4K Cameras. If you are looking for a future proof NVR with the most horsepower, then this is it! It offers plenty of encoding bandwidth, 320Mbps to be specific. You would have to be recording at higher than 20Mbps per camera to reach that limit, and with H.265 and H.265+ encoding you will never reach that limit as it offers up to 70% bandwidth savings over H.264 encoding. Any of our IP cameras that can be found here will work with this NVR. It is truly a future proof unit as it supports all the resolutions of cameras we offer, up to our max of 12MP at the time this description was written. You can expect real-time 30fps recording from any resolution you record as long as the camera is compatible and offers 30fps recording. It is important to note that to record H.265 video, the camera itself has to be a H.265 IP camera, and be compatible with this NVR. Here is a list of popular IP cameras that are compatible with this NVR. This 4K 16 Camera NVR is powered by a powerful Quad-core processor and an embedded Linux operating system that stays virus free. The user interface is easy to use using the included mouse, making it simple to connect your cameras, set recording schedules, and motion detection schedules. 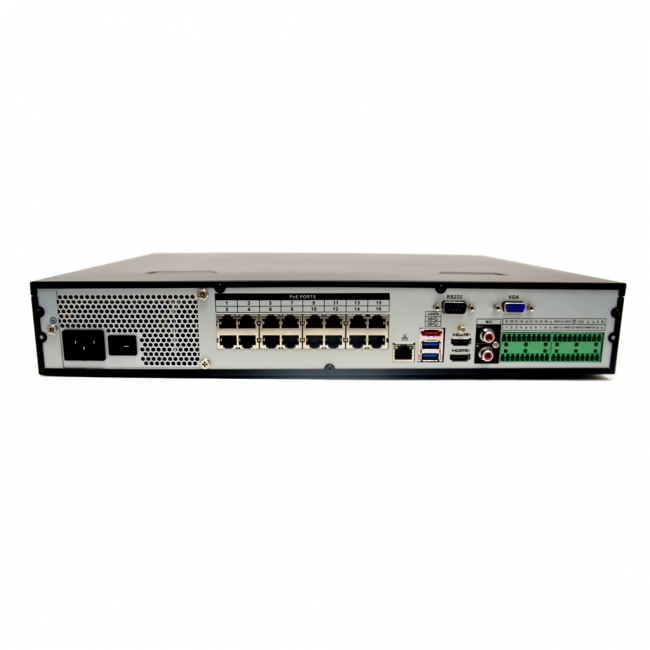 This NVR comes with built-in PoE+ ports for up to 16 cameras, making IP camera installation truly plug and play. All you need is one network cable running from the camera to the PoE ports on the back of this recorder, and the NVR will transmit power and get video from a compatible camera all over one line. You can even use our mini IP pan tilt zoom cameras with this recorder and only one cable is needed for video, power, and PTZ data. Also, there are 3 video outputs (2x HDMI, and VGA) so you can connect up to 2 monitors displaying the same screen (1 HDMI + 1 VGA). The second HDMI port is a spot out for live view only. HDMI one output supports 4K video output so you can enjoy each camera in full screen mode at 4K, which is the best possible resolution. Please note that NVRs do not have strong graphics cards for displaying multiple cameras at resolutions higher than 1080P from the video outputs. Using the HDMI video output on this Quad Core 16 Camera 4K NVR, you can display up to sixteen camera grid views with each camera set to 1080P. Grid displays through the HDMI output vary based on the resolution of the cameras being used. For example, you can view a max of 8x 4MP cameras in the grid view, or 4x 8MP 4K Cameras. NVRs are a hybrid between a NAS device and DVR, and are not built with very powerful graphics display processors to minimize heat issues. If you are planning to use 3MP or higher cameras, you will need a PC running our Client software to act as a viewing terminal. You can Live Display and Playback multiple cameras at 4K when using a powerful PC with a powerful graphics card. Video backups are easy to do as in all of our security DVR. They can be done locally at the NVR using a USB drive, eSATA drive, or external USB DVD burner. You can even download video from the NVR over the network or internet using the included FREE client software for Windows and Mac computers. Please take a look at our videos to see why our products are the Best internet security cameras, demonstrating common functions using our free computer and mobile device apps. Note: Prior to February 1, 2017 this unit was sku NVR516P4K. 1) Would it be possible to use remote PoE switches to reduce cable runs? 2) What is the max # of Cameras that can be recorded at the Higher MP resolutions such as 4MP and above? I understand the playback limitations of the video card but how many camera's can be recorded simultaneously at the higher resolutions? 1) Yes you can use remote PoE switches with this NVR. As long as you have a proper network setup, and connect the NVR's main NIC port to that network, that's all you need. The integrated PoE ports are for plug an play setup as shown in our how to setup a ip camera system guide. 2) You can have all 16 cameras be up to 12mp, and this NVR will record them. There is no limitation to the number of high megapixel cameras. The recording limit has to do with the recording bit rate. If each 4K security camera is recorded at 10Mbps, and this NVR supports up to 320Mbps of Main Stream recording, then you do the following math: 320 Mbps / 15 Mbps = 21 cameras. However, the NVR is limited to a total of 16 channels, so you can see this NVR has excess hardware encoding capability. It's larger 32 Channel NVR sibling uses the same CPU and offers up to 32 channels. Does this work with the IRPTZ230 PTZ camera? Yes you can use the built in PoE port to power a couple of PTZ cameras up to 100ft away. What is the warranty on NVR5164KPOE and what brand/model of HDD are you using in this NVR? Does it support my AXIS cameras: P3365,P1357 and PTZ camera P5415-E? The brand is Avalonix, and the model number is the SKU of the item, i.e. NVR5164KPOE. The camera models you stated are not on our IP camera compatibility list, but similar Axis models are. Although our NVRs do have a native driver for AXIS, success with each camera model from Axis varies. You can try using the AXIS driver, or using the ONVIF connection method as outlined in our guide how to add AXIS cameras as ONVIF. All of our NVRs and DVRs come with a built-in web server to allow configuration changes, viewing, and download. You can see an example of the web interface at the bottom of this page.